1 Is it real that must not do bonfire some camping grounds? 2 Why does it increase the camping ground where to do a immediate fire should not have? Is it real that must not do bonfire some camping grounds? Q. I heard that there isn’t to accept to do bonfire in a camping ground, is it real? A. The rule is decided to depend on the camping ground. Recently, the immediate fire ( doing bonfire immediate on a ground ) isn’t accepted in some camping grounds. But it is OK that some places where accept doing bonfires in the camping ground. Or there is not allowed the immediate fire, but accepting to use the bonfire stand in a camping grounds. Why does it increase the camping ground where to do a immediate fire should not have? Basically, almost camping grounds are managed by the administrator or the owner. You have to keep their words in their ground. And also there are problems of manners before the rules. Camping is fun because it does in the beautiful nature. If you don’t allow the rules, you cannot play in there and the rule become more tightening of regulations than now. Of course, one of the camping ground is allowed to do a immediate bonfire on the ground. The rules of each camping ground are decided by the administrator or the owner, you have to confirm the rule of camping ground when you are booking or visit to them. It is easily to do a bonfire when you use a bonfire stand. A bonfire stand is safe because it does not hurt the ground and the vegetation, and it is easy to clean the fire. Soranoshita rental service has a bonfire stand. 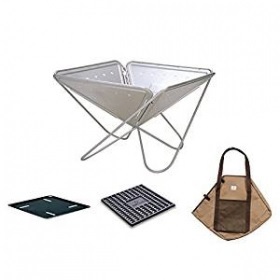 “Bonfire M starter set / snow peak” is constructed a bonfire stand, the plate of bonfire and the carry case. You can easily to enjoy a bonfire. The bonfire of camping is not only to warm yourself but also to be able to feel warm just seeing it. Following the rules and the manners, please enjoy the bonfire in the camp! There is the trail which the time required has a short and is easy to climb for beginners depending on the trail. I summarized the required time and features of the three trails.